WASHINGTON (CNS) — Two U.S. church leaders called for a ban on the sale of military-style assault weapons, saying they have no place in the hands of civilians. Archbishop Blase J. Cupich of Chicago and Bishop Kevin J. Farrell of Dallas issued their appeals in response to recent incidents in which people have been killed by attackers armed with semi-automatic rifles. “There’s no reason in the world why these guns are available. There’s no logic,” Bishop Farrell told Catholic News Service June 22. The bishops’ stance puts them in opposition to gun rights advocates, who say that any effort to limit the sale and acquisition of firearms would violate the Second Amendment of the Constitution. The U.S. Conference of Catholic Bishops was weighing a statement June 23 as the national debate on the need for action on gun control rose in intensity. Since the mid-1990s, the bishops have called for “sensible regulation” and “reasonable restrictions” on firearms. Bishop Farrell’s appeal came in a June 13 blog, a day after a gunman killed 49 revelers in an Orlando, Florida, nightclub. In a separate statement, Archbishop Cupich responded to a string of violence in Chicago the weekend of June 18-19 in which 13 people were killed and more than 40 others were injured in shootings. One victim, Salvador Suarez, 21, was killed by an assailant with an assault rifle outside of a Catholic Church as worshippers attended Mass. Bishop Farrell specifically pointed to the rising use of semi-automatic rifles in attacks as cause for concern and said he decided to express his moral outrage over inaction by Congress in the blog on the diocesan website. Readers overwhelmingly opposed his views in comments on the blog. “I think of the children who died in Connecticut. I think of the people who died in the movie theater (in Aurora, Colorado). I think of the people in San Bernardino. I think of Orlando. What I think is what other motive would we need (to ban such weapons) than to see the way those people lost their lives?” he said. “I ask myself, ‘What’s the common denominator in all this?’ The latest incident in Orlando, a person who should not have been able to get his hands on a military-style weapon that’s destined and designed to kill did. This is not a gun that is used for self-defense. This is a gun that’s an attack gun,” the bishop told CNS. The Texas law allows firearms to be banned from church property as long as appropriate signage is posted. Bishop Farrell’s decision to not allow weapons in churches met with a mixed response, with some readers supporting his stand while others were critical of it in the comments section of the blog. Atlanta Archbishop Wilton D. Gregory took a similar step in 2014 when Georgia allowed licensed gun owners to carry firearms in public places, including churches. Archbishop Cupich urged the entire city to step up to end the violence. “Doing nothing is no longer an option,” he said. Action on any gun control measure has been repeatedly blocked by gun rights backers in Congress. In protest, House Democrats held what they called a “sit-in” that began June 22 and extended overnight to protest Republican leaders’ inaction on guns following the Orlando massacre. House Speaker Paul Ryan, R-Wisconsin, called the action a “nothing more than a publicity stunt” and adjourned the House session until July 5. Democrats pledged to continue to occupy the House floor throughout the 12-day recess. In the Senate, two Republican and two Democratic gun-related measures failed to gain the necessary 60 votes for passage June 20. The measures, which observers said had little chance of passage, would have tightened background checks for firearms buyers at gun shows and on the internet; prevented anyone on the federal terrorism watch list from buying firearms or explosives; and addressed the need for improved mental health service to identify potential attackers. After the votes, Sen. Susan Collins, R-Maine, introduced a so-called “no fly, no buy” bill to prevent individuals on the federal watch lists from obtaining firearms. Collins was flanked by Republican and Democratic senators when she discussed the bill during a June 21 news conference. About 81,000 people, including about 1,000 American citizens, are on the FBI’s no fly list. Another 28,000 are on a “selectee” list and are subject to unusually intensive screening before flying. “Essentially we believe if you are too dangerous to fly on an airplane, you are too dangerous to buy a gun,” Collins said. She said Sen. Mitch McConnell, R-Kentucky, pledged to allow a vote on the bill at an specified future date. Collins’ legislation also would allow anyone denied a gun to appeal through the federal courts and to recover legal costs in pursuing their case. It protects FBI counter-terrorism investigations and includes a “look back” provision to promptly notify the agency if a person who has been in the screening database within the last five years if they have purchased a firearm. The National Rifle Association opposes Collins’ measure, calling instead for a stronger effort to fight the Islamic State group and reduce its influence in radicalizing people to strike public venues. The NRA and other gun rights groups have long opposed any limits on guns including reinstitution of an assault weapons ban, expanded background checks and waiting periods to complete gun sales. Instead, they have sought expanded access to firearms, saying that responsible gun owners could have slowed or stopped attacks before a large amount of deaths and injuries resulted. A report by the Congressional Research Service in 2012 estimated that 310 million firearms were in civilian hands, including 114 million handguns, 110 million rifles and 86 million shotguns, roughly one weapon for every person in the U.S. According to the study by CDC citizens use guns to protect themselves from harm and/or loss 4000 times per day. According to the study by Gary Kleck this happens 2000 times per day. The NRA is 5 million members who vote out of office those legislators who don’t support the will of the people. With a few exceptions killings occur in gun free zones. Chicago is a gun free zone. Remove gun free zones and allow people to protect themselves and killings will go down. One more example of why people like me have left the Catholic Church. The move to the left on a host of social issues in an effort to seem relevant has caused church leadership to sell their souls. I guess it is no wonder that the US church has pushed so hard to import members in an effort to stop the hemorrhaging. “This is not a gun that is used for self-defense. This is a gun that’s an attack gun”. Let’s see, if we pick certain times in history, let’s say the Spanish Inquisition, the trial of Galileo Galilei, accusation against the Templar Knights, mid evil witch hunts, etc., we may get the idea that no one “needs” Catholicism. Now, I am not a proponent of removing religious houses for past indiscretions, nor should you be against the millions of people who own a semi-automatic rifle and use them responsibly for sport, hunting, and yes, even self-defense. So, does this mean the Bishops are encouraging their flock to follow Jesus’ command in Luke 22:36? COOL…. Although they should remember that such a weapon requires MUCH more skill to use effectively than a firearm does. Yes indeed, the next time I want to know about the Catholic Faith I’ll go find a gun dealer. After all if the bishops are such experts on firearms, then logic follows that gun dealers will make great priests. Mr. Sadowski I suggest you learn the difference in “assault rifle” and “assault weapon”. Your ignorance of arms is glaring, though typical. That the bishops are as ignorant as well, is also glaring and telling about their abilities to advise anyone. These Bishops need to thump their bibles and keep their (mouths) shut on firearms issues which they know nothing about. The bishops should stick to religion and keep their noses out of issues about which they are not experts. Using their station as church authorities to disable citizens’ fundamental rights is unethical. This is the same dilemma Connecticut gun owners found themselves in at the end of 2013. 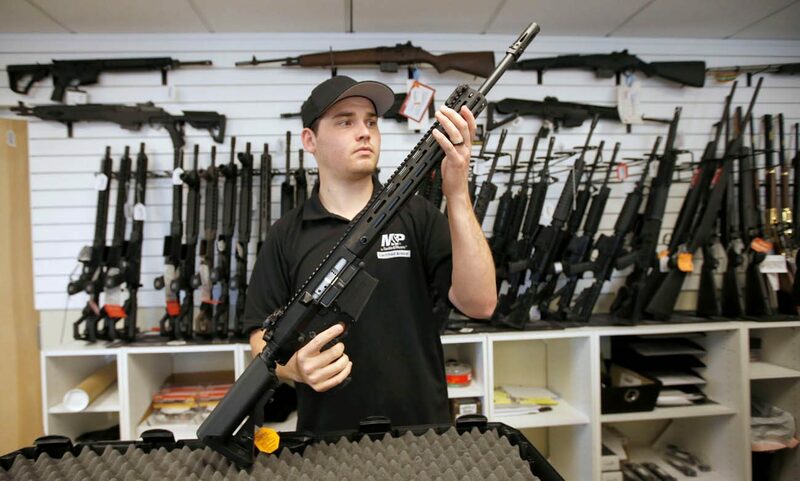 As of December 31, 2013, according to Lt. J. Paul Vance of the Connecticut State Police (CSP CSPI +3.75%), the state had received 41,347 applications to register “assault weapons” and 36,932 applications to register “high-capacity” magazines. That means that more than 300,000 Connecticut residents decided not to register their “assault weapons,” moved them out of state, or sold them. If the church wants a voice in government, what are they willing to pay for it? Their tax-free status is connected operationally to them keeping their secular opinions to themselves. Do these bishops really “need” the right to worship as they see fit? Do civilians really “need” the right to pray or vote or speak out against the government? Do we really “need” the Bill of Rights? Do we really “need” the Constitution?